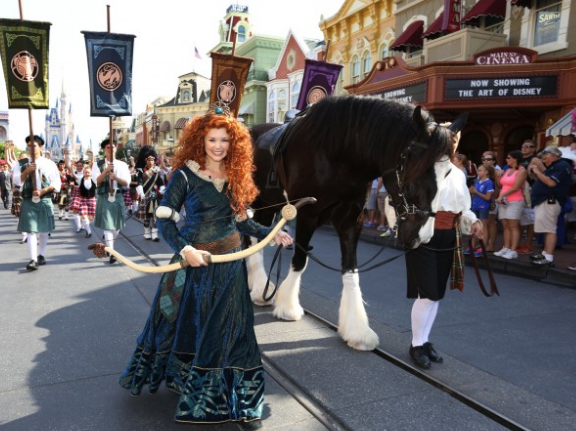 LAKE BUENA VISTA, Fla. (May 11, 2013) – In celebration of mothers and daughters everywhere, Disney today proudly welcomed Merida from Disney∙Pixar’s Academy Award winning film, “Brave,” into the Disney Princess royal court. With her mother Queen Elinor proudly by her side, the ceremony took place at the Magic Kingdom in front of Cinderella Castle at Walt Disney World Resort in conjunction with Mother’s Day festivities. Gymnastics Gold Medalist and All-Around champion, Gabby Douglas, hosted the celebration accompanied by her mother, and shared her personal story of strength, perseverance and courage – the true meaning of being a Disney princess.